"How to get rid of carpenter ants" is a concern many homeowners face between the months of March and Septemer. If your home is near or adjacent to a wooded area, and especially if there is a lot of moisture in the vacinity, you may be targeted by a local colony of carpenter ants. 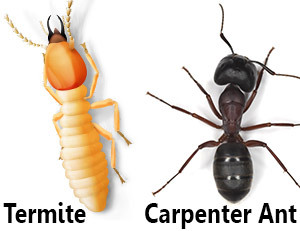 Unlike termites, carpenter ants do not eat wood. However, they can cause extensive damage by burrowing into wood to create the smooth galleries in which they live and breed. Carpenter Ants: How do you know if you have them? 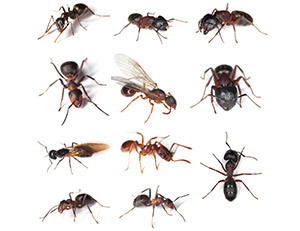 One of the first signs you may have a carpenter ant problem is the presence of the smooth galleries they burrow into the wood of your home's foundation, framework or siding. You may also observe the small piles of sawdust-like "frass" they leave behind as they excavate wood. In addition there may be ant skulls present (the skulls are the last body parts to decompose). Is it a carpenter ant or a termite? While there are many similarities between carpenter ants and termites, the key differences are that carpenter ants have bent "elbowed" antennae and their bodies are divided into three sections with a narrow waist. How Did The Carpenter Ants Get There? * Leaky gutters, pipes, poor drainage. * Soil in direct contact with wood siding. * Trees, branches, shrubs rubbing against the house. Eliminate standing water around your home and dry out moist areas. Prune back trees and shrubs that might be touching your house. Calk cracks and openings around the base of your home. Weatherstip windows and doors. Stack firewood well away from your home. Don't leave sweets, meat or fat lying around, in hidden cracks, behind the refrigerator or stove...etc. Master colony and satellites: There is usually a master colony in the vicinity of your home. This colony is likely to create a satellite colony inside your home. Tracking down and eliminating the master colony can be a challenge. As long as that colony exists, the carpenter ants may keep reappearing in your home no matter what measures you take to exterminate them. Baits and Gels: There are a number of over-the-counter carpenter ant baits and gels which mainly interfere with the nervous system and reproductive process of carpenter ants. The carpenter ants take the bait back to their nest, which then affects the entire colony. In addition, mixtures of boric acid and sugar have shown some success. How to get rid of carpenter ants successfully is not just a matter of the effectiveness of the particular substance used. A good part of success involves understanding the ant's habits and having the skill to locate and exterminate every colony in the vacinity of your home. 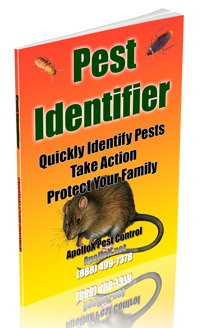 ApolloX Pest Control Has The Skill, Experience and Equipment to Safely Get Rid of Carpenter Ants! How to Get Rid of Carpenter Ants? Do you think you have a carpenter ant problem? Don't wait until they create further damage to your home.